Mount Vesuvius - The volcano that blew its top in 79 A.D., killing thousands of Roman citizens in the towns of Pompeii and Herculaneum. A century and a half before that, the slave Spartacus and his followers took refuge on the mountain as they tried to avoid re-capture from Roman authorities. 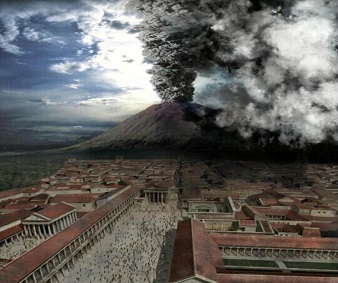 It is the most famous eruption of ancient times for two reasons. The explosion was witnessed by Pliny the Younger who recorded what he saw. And thousands of its victims were discovered preserved in ash in 1748. It remains the only active volcano on continental Europe.